Ralph Malph of the Freakbike Militia posted this invitation for a chopper ride in West Palm Beach Friday the 13th of March. See details below. Hey Greasers and Pin Up Chicks…….Mark your Calendars for Friday, March 13th. This Choppernite we are gonna Rock Round the Block! That’s right Guys and Gals, get out your Pomade and Poodle Skirts, Leather Jackets and Cateye Glasses it’s gonna be a Fifties Cruise! Cuff up those Jeans and get out that Plain White T-Shirt, we’re going back to the Fifties, and things are going to be a little different this time around….so read closely. Fonzy told me that this is a Benefit ride for our friend “Jack the Bike Man“. Jack is the Man of the night from 6:00pm until 9:00pm at the Northwood Village Street Party. The Event takes place on Northwood Road between 23rd and 24th Street, just North of Clematis off Dixie (details on location at bottom). There will be local artists displaying work, wine tasting, music, food and beer, so bring some extra money, all proceeds from food and drinks go to Jack. There may be some 50’s era cars being showed off as well as our bikes, and there will be a few games for the Freaks as well. 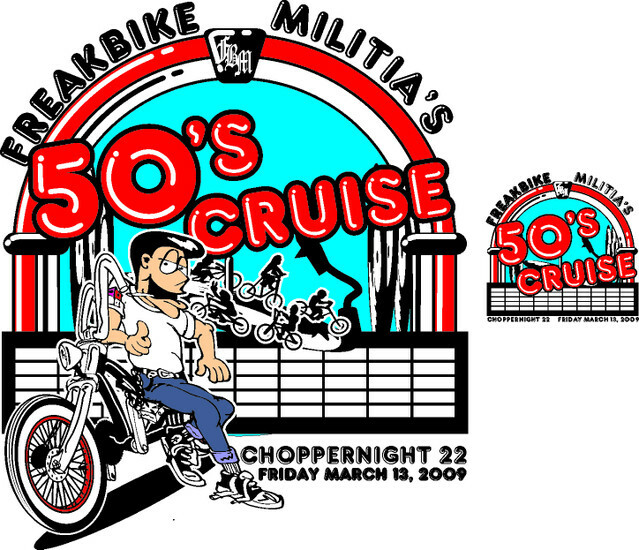 It was requested that as many Freakbikers as possible and their creations show up at that location at 6:00 o’clock to get the Party started, There is plenty of parking nearby as the street will be shut down for the event. Line them bikes up right down the center! ***For those who cannot make it there by the 6 o’clock kickoff time, there will be two waves of group rides leaving from the corner of Southern and Flagler near the Greek Church. Riders leave at 5:30 and 6:30 P.M. The Church unfortunately has service that night so we do not have permission to use their lot this time. Parking is available just before the Church on the north side at the abandoned bank, across the bridge or any side street. At 5:30 sharp, the first group will leave Southern and Flagler and head straight up Flager, past Okeechobee and Clematis until they reach Curry Park. Turn left over to Dixie and then up and over onto Northwood Road. You should arrive at 6:00. This is only a 1 mile difference from the normal Choppernite route. The second wave will be leaving the corner of Flagler and Southern at 6:30 sharp, to arrive at 7:00 o’clock. As always, Headlights and taillights and good behavior are expected. Please try to dress the part, this is an easy one and can be very fun. C’mon you know you’ve always wanted to be Elvis for a night. Go north on Washington Rd. until it turns into Flagler Dr.
Continue north on Flagler Dr. until you reach 23rd St. near Currie Park. Turn north of Dixie Hwy and go one block to Northwood Rd. and join the Northwood Village Street Party. You WILL see bicycles like you’ve never seen before. These ain’t your daddy’s Schwins. CategoriesBike Rides and Routes, Bikes, You Ran Over What? Carly and I are interested in going, but she realistically can’t be ready until about 7PM. I assume that means we’ll miss the big ride out. Dad, call me and we’ll talk details. Next PostNext Space Shuttle Launch Postponed, Darn It!